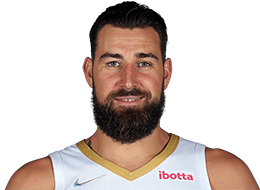 Jonas Valanciunas leaves the game after twisting his right ankle, stay tuned to NBA.com for more information. Appeared in 81 games (all starts) in his second NBA season, averaged 11.3 points, 8.8 rebounds 0.7 assists, 0.3 steals and 0.9 blocks in 28.2 minutes... Led the team in rebounds (714), offensive rebounds (226) and double-doubles (25)... Toronto is 21-11 when he collects 10+ rebounds and 5-0 when he scores 20 points... Shot .586 (140-for-239) from the floor in 29 games after the All-Star break... Scored in double figures in 11 straight games (Mar. 26 - Apr. 14) - averaged 17.1 points... Recorded 14 points and a career-high 21 rebounds Apr. 11 vs. New York. Became the ninth Raptor to collect 20+ rebounds in a game... Scored a career-high 26 points Apr. 9 vs. Philadelphia... Played a career-high 45 minutes Mar. 21 vs. Oklahoma City... Missed one game (Mar. 19) with a sprained lower back... Left the game late in the third quarter Mar. 18 at Atlanta with a sprained lower back... Averaged 9.7 points and 8.3 rebounds during 12 games in February... Scored a then season-high 23 points Mar. 14 vs. Memphis. Made a career-high 11 field goals against the Grizzlies... Started and played 19 minutes in the BBVA Compass Rising Stars Challenge at All-Star Weekend in New Orleans. Finished with four points, two rebounds and two assists... Scored in double figures in seven straight games (Jan. 25 - Feb. 5)... Averaged 10.5 points and a team-high 9.1 rebounds in January... Recorded three straight double-doubles (Jan. 25-29)... Averaged 12.4 points and 9.4 rebounds during 14 games in December... Led (or tied) the team in rebounding in five straight games (Dec. 23 - Jan. 1)... Recorded team highs of 15 points and nine rebounds Dec. 31 at Chicago - first time leading the team in both scoring and rebounding in the same game... Collected a then career-high 18 rebounds Dec. 27 at New York... Set career highs in field goal attempts (16) and off. rebounds (8) Dec. 1 vs. Denver... Totalled a then season-high 19 points and nine rebounds Nov. 17 vs. Portland... Had third-year team option exercised on his rookie scale contract Oct. 24... Competed for Lithuania in September at the Eurobasket Championship and earned a silver medal... Named MVP of the 2013 NBA Summer League after averaging 18.0 points and 10.0 rebounds in four outings. Playoffs: Finished with nine points and nine rebounds May 2 in Game 6 at Brooklyn... Contributed with 16 points and six rebounds Apr. 30 in Game vs. Brooklyn... Earned his third straight double-double Apr. 25 in Game 3 at Brooklyn with 10 points and a team-best 10 rebounds. Also added two blocks... Recorded his second double-double of the playoffs Apr. 22 in Game 2 vs. Brooklyn - 15 points and 14 rebounds... Set a Raptors playoff record with 18 rebounds Apr. 19 in Game 1 vs. Brooklyn... Recorded a double-double (17 points, 18 rebounds) Apr. 19 in Game 1 vs. Brooklyn, joining Tracy McGrady as the only other Raptor to record a double-double in his playoff debut. 2012-13: Averaged 8.9 points, 6.0 rebounds and 23.9 minutes in 62 games … Ranked among top-3 rookies for field goal percentage (.557), rebounds (6.0) and blocks (1.26) … Inactive for 20 games … Missed two games (Apr. 12-14) due to flexion extension injury of his neck … Averaged 9.4 points, 6.1 rebounds, 1.3 blocks and 25.0 minutes in 57 starts … Scored in double digits 28 times … Led the team on the glass 18 times … Had eight double-doubles and grabbed 10+ rebounds 10 times … Scored in double figures in 12 consecutive games (Mar. 15 - Apr. 6) … Poured in a career-best 24 points and set team rookie records shooting 16-for-18 at the free throw line Apr. 3 vs. Washington … Blocked a career-high five shots Apr. 1 vs. Detroit … Named Eastern Conference Rookie of the Month for March, averaging 11.4 points, 7.3 rebounds and shooting .620 from the field in 15 games … Recorded 14 points, matched his career high with 13 rebounds and blocked four shots Mar. 29 at Detroit … Scored a team-high 19 points Mar. 27 vs. Atlanta … Recorded back-to-back double-doubles (Feb. 8-10) … Grabbed a career high-tying 13 rebounds Feb. 8 at Indiana … Returned to the lineup Feb. 1 vs. L.A. Clippers and grabbed three rebounds in 13 minutes … Missed 18 games (Dec. 26 - Jan. 30) with a fractured metacarpal on his right ring finger … Made 28 straight starts prior to being placed on the inactive list Dec. 26 at San Antonio; became the first rookie to start each of his team’s first 20 games of a season as a centre since Shaquille O’Neal started Orlando’s first 67 games in 1992-1993 … Left at the 7:31 mark of the first quarter with a fractured metacarpal on his right ring finger Dec. 21 vs. Orlando … Registered at least one blocked shot in 10 straight games (Nov. 18 - Dec. 5) … Scored 22 points Nov. 25 vs. San Antonio … Recorded back-to-back double-doubles (Nov. 20-21) … Corralled 11 boards Nov. 20 at Philadelphia … Scored a team-high 18 points and had six boards Nov. 6 at Oklahoma City … On Oct. 31 vs. Indiana, joined Damon Stoudamire as the only rookies in team history to post a double-double (12 pts, 10 rebs) in his NBA debut … Became the fifth rookie in team history to start on opening night … Named FIBA Europe Young Men’s Player of the Year for 2012. PROFESSIONAL CAREER: Was named NBA Summer League 2013 MVP after averaging 18.8 points, 10.0 rebounds and 29.3 minutes in four outings … Shot .561 (23-41) from the field and .879 (29-33) from the foul line … Won FIBA Europe Young Men’s Player of the Year for 2011 and 2012 … Participated in the 2012 Olympic Games with the Lithuanian National team, averaging 4.2 points, 4.0 rebounds and 11.7 minutes in six games … Posted highs of seven points, nine rebounds and 16 minutes vs. Russia … Has averaged 11.6 points, 6.9 rebounds and 1.7 blocks, shooting .653 per cent from the field in 84 Lithuanian League games … 2011-12: Averaged 14.2 points, 7.4 rebounds, 1.9 blocks and 23.5 minutes in 23 contests in the Lithuanian League … Scored in double figures in 17 games and grabbed double-digit totals in rebounds in seven outings … Shot .682 from the field and .825 from the charity stripe … Grabbed a season-high 14 rebounds Dec. 23 against Juventus … Had a season-high 25 points (8-10 FG) with 12 rebounds and a season-best six blocks Nov. 12 against Pieno Zvaigzdes … Averaged 10.7 points, 7.3 rebounds, 1.7 blocks and 22.5 minutes in 23 games in the VTB United League; 10.3 points, 7.0 rebounds, 1.0 blocks and 23.0 minutes in four games in Baltic League play; and 8.0 points, 6.3 rebounds, 1.3 blocks and 18.0 minutes in three games in Euroleague action … Shot .593 per cent from the field in the United League; .571 in the Baltic League; and .500 in the Euroleague … Recorded 16 points and 10 rebounds in 27 minutes vs. Ventspils in Baltic League action … Tallied 11 points and eight boards in 18 minutes in Euroleague play vs. Buducnost … Had 17 points, 10 rebounds and three blocks in 28 minutes against Lokomotiv in Eurocup action … Named Most Entertaining Player in Lithuanian League All-Star Game … Named FIBA Europe Young Men’s Player of the Year for 2011 … Earned Eurocup Rising Star Trophy for 2011-12; the trophy recognizes the most outstanding player under 22 … 2010-11: Averaged 11.5 points, 7.3 rebounds, 1.8 blocks and 20.6 minutes in 33 contests in the Lithuanian League … Ranked first in the league in blocks, third in rebounds and second in field goal percentage at .668 … Scored in double figures in 22 games and grabbed double-digit totals in rebounds in nine outings … Had a season-high 23 points on 9-of-10 shooting in 22 minutes vs. Rudupis in the Lithuanian League playoffs … Grabbed a career-best 18 rebounds and added 19 points in 21 minutes against Alytus Alita … Totaled 22 points (10-of-12 FG) and 13 rebounds vs. Juventus … Averaged 7.3 points, 5.1 rebounds, 1.4 blocks and 17.3 minutes in nine games in the VTB United League; 12.0 points, 5.3 rebounds, 1.8 blocks and 20.8 minutes in four games in Baltic League play; and 7.7 points, 5.8 rebounds and 14.9 minutes in 15 games in Euroleague action … Shot .560 per cent from the field in the United League; .792 in the Baltic League; and .708 in the Euroleague … Had 22 points on 10-of-12 shooting in 25 minutes vs. Siauliai in Baltic League action … Had a double-double with 10 points and 10 rebounds in 16 minutes in his Euroleague debut vs. Fener Ulker … Had 16 points, nine rebounds and two blocks in 22 minutes against Cibona in Euroleague play … 2011 European Championships: Averaged 8.4 points, 4.1 rebounds and 1.1 blocks in 10 games … His first action for his country’s men’s senior national team … Shot .660 FG and .750 FT … 2011 U-19 World Championship: Averaged 23.0 points, 13.9 rebounds and 3.2 blocks en route to the Most Valuable Player award … Shot .595 from the field and .818 from the free throw line … Led Lithuania to the championship … Scored 36 points and added eight rebounds and four blocks in 40 minutes in the championship game victory over Serbia … Had 26 points and 24 rebounds against Poland and 30 points and 15 boards vs. the United States … 2009-10: Started the season in the Lithuanian League with Perlas Vilnius, averaging 11.6 points, 7.5 rebounds and 1.5 blocks in 21.9 minutes over 13 appearances … Had 21 points and nine rebounds in 23 minutes vs. Techasas … Notched 20 points and six rebounds in 23 minutes vs. Zalgiris … Played in eight Baltic League games, posting 12.4 points, 8.6 rebounds and 2.4 blocks … Collected 21 points (8-10 FG), nine rebounds and five blocks in 27 minutes vs. Aisciai … Joined Lietuvos Rytas in January where he averaged 8.9 points, 5.1 rebounds and 1.2 blocks in 16.9 minutes in Lithuanian League play … Totaled 22 points (8-11 FG) and nine rebounds in 23 minutes vs. Alytus … Participated in eight Baltic League games as a member of Lietuvos Rytas, averaging 11.0 points, 5.1 rebounds and 1.4 blocks … Competed with Lietuvos Rytas’ junior team in the Ciutat de L’Hospitalet tournament, a qualification for the Nike International Junior Tournament; played in four contests, averaging 21.5 points, 13.5 rebounds and 4.0 blocks in 28.4 minutes … Recorded 24 rebounds vs. Unicaja’s junior team and 33 points vs. KK Split’s junior squad … Shot a perfect 8-for-8 FG for 23 points, while adding 14 rebounds, three steals and two blocks vs. Italy … 2010 U-18 European Championships: Earned Most Valuable Player honours leading Lithuania to the gold medal … Averaged 19.4 points and 13.4 rebounds in nine outings … Ranked first in the tournament in field goal percentage (.667) and rebounding, and second in scoring and blocks (2.7) … Recorded 34 points (14-16 FG), 13 rebounds and four blocks in 27 minutes vs. France … Had 31 points (12-15 FG) and 18 rebounds in the title game vs. Russia … 2008-09: Played for Perlas Vilnius in Lithuania’s second division, the NKL, averaging 10.1 points, 7.8 rebounds and 2.1 blocks … Competed at the Nike International Junior Tournament for Lietuvos Rytas’ junior team, averaging 16.1 points, 10.9 rebounds and 2.9 blocks in 21.3 minutes over eight games … Earned All-Tournament accolades … 2009 U-18 European Championship: Averaged 19.3 points and 10.6 rebounds in nine games, earning All-Tournament honours … Ranked second in the tourney in scoring, first in field goal percentage (.721), third in rebounding and second in blocks (2.6) … Totalled 37 points (13-19 FG), 19 rebounds and four blocks vs. France … 2008 U-16 European Championship: Averaged 14.2 points and 11.1 rebounds. Selected in the first round (fifth overall) by the Toronto Raptors in the 2011 NBA Draft. Name is pronounced YO-nahs vah-lahn-CHEW-nahs … In the Eurobasket 2009 U-18 All-Star Game, finished with game highs of 18 points and 19 rebounds … Participated in the NBA and FIBA Basketball without Borders Europe camp in Instabul, Turkey in June 2008.